The man suspected of robbing a Lincoln Square jewelry store employee at knifepoint last month is in custody, police said. 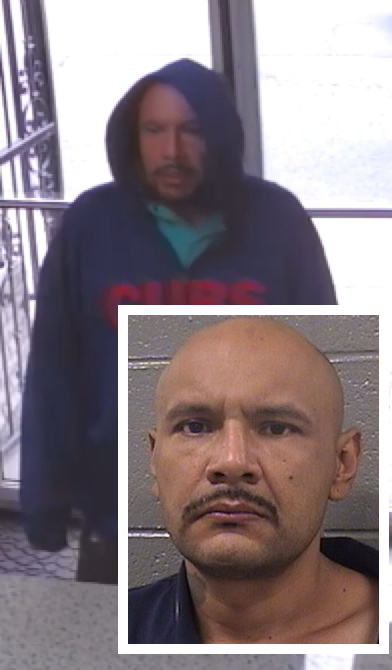 Fidel Belmontes, 39, of Brighton Park is accused of being the man shown in two separate police alerts this summer that connected him to as many as eight armed robberies across the city. He was released from federal prison in February after serving time for a series of bank robberies. Officers conducting surveillance in Little Village saw Belmontes around noontime on September 15, police said. They had Belmontes arrested, knowing that he was wanted after being identified in a photo array by one of the robbery victims, according to court records. So far, Belmontes is formally charged with armed robbery and aggravated robbery-indicating firearm in connection with two of the alerts' eight crimes. Prosecutors say he a robbed a Little Village dry cleaners of $200 while armed with a knife and robbed a woman in Brighton Park. Additional charges may be filed, police said. On August 4, a man walked into the Nomadic Ant, 4604 North Western, around 5:20 p.m. and placed a knife to the side of an employee’s chest. After demanding “all of the money,” he then fled southbound on Western Avenue with cash. CWBChicago has learned through a source that detectives are closing out the Nomadic Ant case with Belmontes being considered the responsible party. Court records show that Belmontes was sentenced to 10 years in prison in 2004 after he pleaded guilty to a series of armed robberies in the city. He is currently held without bond.